"I was really enjoying my studies on the course, and knew what a big emphasis the University places on gaining experience while studying," says Mark. "The gallery curator for the Borough Road Gallery spoke to students on the course, and mentioned that there were opportunities to undertake work placements there," Mark recalls. "It was an amazing opportunity to gain some experience from organising events at a gallery right on our doorstep, so I made sure I seized the opportunity immediately!" As part of his placement, Mark helped organise the gallery's launch night where he was able to put a lot of his learning into practice. "The course had really broadened my understanding of arts management," he says. "As a result of the skills I was able to demonstrate while preparing for the opening of the gallery, I was offered the chance to organise a private viewing. Again, I jumped at the chance to get such useful hands-on experience!" Organising the viewing was a two-month process for Mark, and enabled him to showcase the full range of skills that he had developed during his studies. "It tested everything I had learned during my degree," he says. "Budgeting, research, marketing, co-ordination, time management, resource investigation, health and safety – I needed it all!" Working with a small team – but with plenty of support and policies provided for him to adhere to – Mark threw himself into the challenge with gusto. "I learned so much from the project," he admits. "Undertaking real projects introduces challenges that you simply can't replicate in a classroom, and added so much to my learning. For example, the scale of the event changed once we were underway, and the brief was regularly revised, meaning I had to think on my feet when it came to applying the theory." 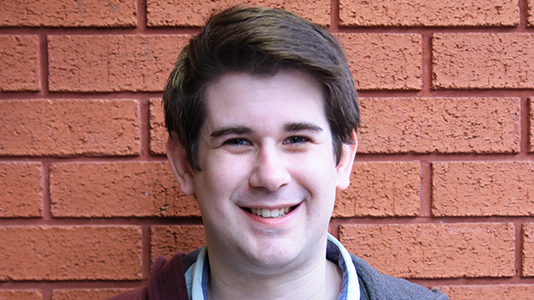 Mark was grateful for the constant help and support he received from LSBU. "Although it was a big challenge, I never felt alone or out of my depth," he says of the experience. The support from LSBU was great – I felt more like a staff member than a student here, and knowing that the University was behind me meant I could concentrate on the job in hand. It was an effort that bore fruit when it came to the private viewing. Over 160 people attended the event, which was an excellent return and Mark is quick to pay tribute to the skills he has developed as part of his course. "It was a great demonstration of just how practical an LSBU education is," he says. "It honestly feels as though BA (Hons) Arts and Festival Management is a sort of Business Studies for the arts. There was so much to do – email campaigns, managing databases, liaising with the curator – but my degree had prepared me for all of that and more."